Put sliced bananas in an 8 x 8 or similar size serving dish. Heat milk in a sauce pan over medium high heat. In a small bowl whisk together flour, sugar, and salt. Reduce heat to medium low and add flour mixture to milk in four additions, whisking to incorporate after each addition. Beat egg yolks lightly in a bowl and whisk in a small amount of the milk mixture – about ¼ cup – slowly so you don’t make scrambled eggs! Whisk egg mixture into milk and continue to stir until pudding consistency – about 3 minutes. Stir in butter and vanilla and pour pudding over the bananas. 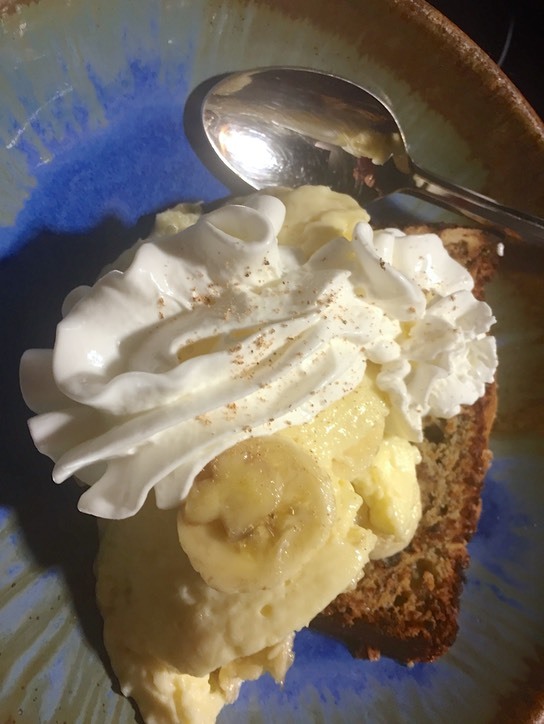 For assembly: Sliced and toasted banana bread, topped with pudding, and a dollop of whipped cream. You can dust with a bit of nutmeg for an extra special touch.